I read this history in the text by Enrico Mariani (Monte Castello di Tignale. 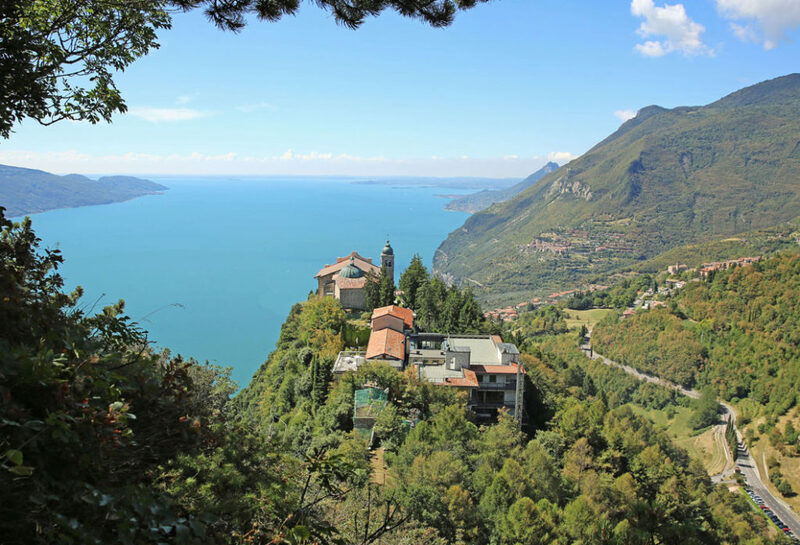 Un santuario del Garda fra Trento e Brescia. Vannini, Brescia, 2004. (Monte Castello di Tiagnale. A sanctuary between Trento and Brescia”. Ed. Vannini, Brescia, 2004), and found the whole story incredibly interesting. However, sitting in the darkness of this church made my limbs shiver a bit, I needed a cheer up so asked at the bar outside and they suggested a walk to the cross above the sanctuary following the sign N. 266 that leads behind the church. It is a beautiful walk towards the Mount Cas where one finds a huge cross from which there is an even better view all over the lake. But I decided to follow the path as I was curious to see where this was leading. At a certain point descending on the other side of the mountain, at a curve I was impressed by an incredible view. At my feet there was the town of Campione, the plateau of Tremosine on the hills and the fjord of the lake with a dark blue. The view was as far as Riva to the north, but by turning my sight to the south the lake extended like a sea and the colour was of a lighter, soothing blue. I found this point emblematic of this place, I could feel the sense of border, of limit, as if the lake had two dimensions : the spooky north and the open south. However, the path descended and I walked down through the wood and reached PRABIONE. At the Centre of the park is an interesting museum that tells about rural tradition of these higher parts of Lake Garda. The path goes down from this point and in one hour one could reach the little town of Campione, a beautiful walk that leads through the cleft to the dam of the San Michele river. I decided to walk back as I had my car parked at the sanctuary.